Buddha-nature: Theravada Zen – Wake Up and Laugh! Last year, as part of its tenth anniversary celebrations, the Bangkok Hanmaum Seonwon hosted a joint Dharma talk on the subject of Buddha-nature with the Theravadan monk Phra Cittasamvaro Bhikku, the founder and guiding light of the English-language Littlebang Sangha, and Chong Go Sunim, who had kindly made the trip from the Hanmaum International Centre in Anyang, Korea. Phra Cittasamvaro Bhikku, popularly known as Phra Pandit, started the evening with a brief history of Theravadan and Mahayanan Buddhism, and how the differences between them are not as great as they might at first seem. After all, he said, everything started at the same point, with the Buddha putting aside all theories and looking into the nature of things for himself. What he saw under the Bodhi tree was experience in terms of fields of awareness, sight, sound, taste, and so on, and that they were forever changing. Finding no stability in this, he withdrew his mind and found it becoming brighter and sharper. And what he discovered there, the Buddha declared, was that which does not die. He gave this a number of names such as original mind, source of mind, Nirvana, and so on, and later it was termed Buddha-nature. Phra Pandit suggested it was perhaps a little egotistical to give it this name as it exists in all people, regardless of the labels they use. A bit, he teased, like planting a flag on the moon. He also pointed out that seeing this fundamental mind is a temporary experience and that we inevitably return back into normal life. However, once seen, it will change one’s way of relating to the world. The great problem, though, is how attainment of this fundamental mind can be taught. No matter what is said about it, it is not it. So Buddhist teachings are like radio stations. We can switch between them, some we will like, some not, but the point is the silence beneath. Using the analogy of the diamond in the mud, Phra Pandit said that reaching it through purification or reaching it through realisation were simply differences in emphasis. Chong Go Sunim agreed, pointing out how the Buddha’s teachings, using another analogy, are like medicine. And no single medicine is good for all illnesses. So a range of Buddhist teachings developed according to the needs of listeners. Different Sutras, in fact, are simply saying, “okay, let me put it like this, now like this”. But the point to all these teachings is to transcend the limited sense of self, and Chong Go Sunim described how his own teacher, Seon Master Daehaeng Sunim, emphasises the practice of letting go. Like chanting, bowing, and meditation, he said, it is a tool for transcending the self, and a self-correcting one at that. Often, he said, people have great meditation experiences or insights, but make the mistake of saying “wow, I want that again”. Soon, they are carrying around little more than a memory of a past experience. By practicing letting go, they are able to move on from it. But to carry out this practice requires trust. Which is where Buddha-nature comes in. Chong Go Sunim, before he became a monk, used to sky-dive, and he explained that no matter how badly you might be spinning through the air, simply getting into the correct position allows you to right yourself. In terms of practice, that position is the act of trusting and letting go. “Perhaps this is all just a skillful means” Chong Go Sunim said, “but I can’t say it’s not true” and with the way that one’s ignorance grows back again and again, just like a monk’s hair, one must return to this practice over and over. Like the the Diamond Sutra, he concluded, which seems to repeat itself, but at deeper levels. The evening ended with a short time for questions and answers and in response to one question Chong Go Sunim, using the large bell at the front of the Dharma Hall, demonstrated, to an audience of mainly English-speaking Bangkok residents, the sound of a Korean chant. The perfect way to round off a unique and wonderful evening of Dharma. Theravada is ok for the first step – don’t rush to be upset with me or something, this was said by the Buddha himself, not in these exact words, but with the same meaning, and Tibetan teachings point out the same, it is not to look down on Theravada monks or something, ideally they are supposed to be good practitioners, but in reality there are too many problems with buddhism in Thailand. Daehaeng KunSunim’s teachings much more closer to Tibetan teachings than Theravada or even Zen. ” seeing this fundamental mind is a temporary experience and that we inevitably return back into normal life.” – with all due respect, “normal life” is fundamental mind too. If you only planning to stay in first grade, then getting to university will never happen. Anyway, Thailand and its buddhism has too many problem. It is a tradition to send all males to be monks before they get married, so it is no big deal, and as for females -their rights never even addressed by buddhism, it is normal in Thailand to sell a girl and working on the streets is considered normal, even honorable profession, especially if the girl is sold to get money for her brother who wants to be a monk, because to become a monk you need to bring money with you. I’m not going to ‘rush to be upset’ with you, but I have to say that I am saddened by your response and your sweeping condemnations of a form of Buddhism and a society you clearly know very little about. I’m so glad, Tanya, that you have found a Dharma path that is right for you – nothing could be better – and it’s wonderful that you feel strongly it is the right path. But there is no need to belittle the paths of others by calling it just the ‘first grade’ etc. The Buddha, you will recall, talked of skillful means, and it’s all skillful means Tanya. Even Seon, even Hanmaum, is a skillful means, and when we stand before the truth (as Kun Sunim teaches) the differences between the paths will be totally insignificant. Believe me, I know a good many Theravada practitioners and have nothing but respect for the wisdom and compassion that such a path can bring one to. I certainly haven’t heard in any Theravada practioner I’ve personally met, the kind of derogatory comments of another’s path that I see in your comments here. As for saying “it is normal in Thailand to sell a girl”, you couldn’t be more wrong – or more sweeping in your gross and insulting generalisations. How much do you actually know about Thai society? Tanya, I’ve lived in Thailand, on and off, for over ten years, I have a Thai wife and two Thai children, and work every day of my life with Thai people. To suggest that Thai society sees working on the streets as an “honorable profession” couldn’t be more wrong. The issues are, of course, complicated. Complicated by questions of class, sexism, and regional identity, and further muddled by the ignorant views of outsiders, with generalisations like yours that are simply not true. 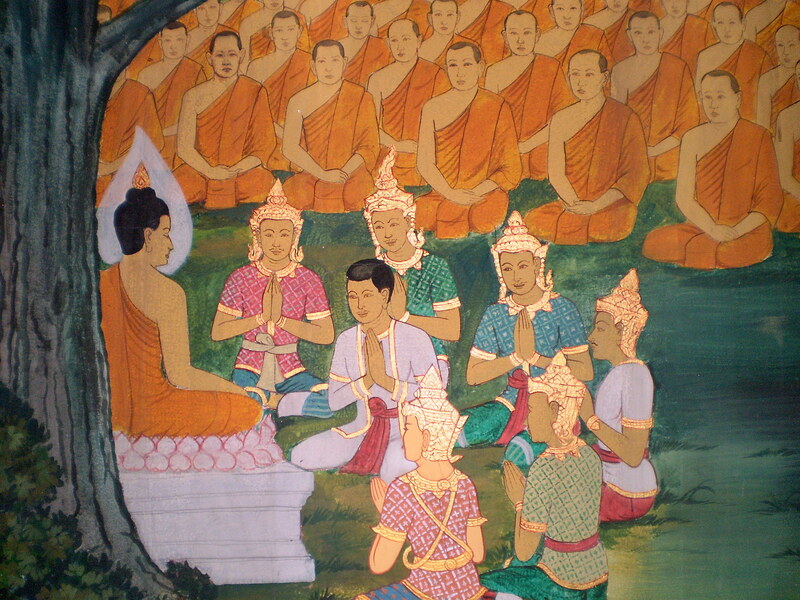 You’ve never heard anybody from the Theravada tradition say anything nice about women? How about Bhikkhuni Dhammananda? How about Mae Chee Brigette? How about any number of the many millions of Thai woman practitioners? There are lots of Therevada woman happy in their religious path and addressing the issues that need to be addressed from within that path. Do Thai people need KunSunim’s teachings to address the complicated issues of women and Buddhism in Thailand? Of course not! Thai people and Thai women and the Thai Sangha are perfectly capable of addresing their own issues from within their own tradition. Of course if some Thai practitioners wished to look towards KunSunim and her teachings they would find much of great value. But there is no need at all for the kind of evangelical posturing you seem to suggest in your final sentence. Tanya, all Buddhisms are Buddhism, and I rejoice at anyone finding the path that is right for them. What I do NOT do, and ought not do, is suggest to others that their path is merely an elementary path whilst mine is the advanced degree. Is that really the attitude of a practitioner? I say all this not in order to insult or belittle you Tanya, but because after many years of involvement in both Thai and Korean Buddhism, I know from much personal experience that both paths are, how is it put, beautiful in the beginning, beautiful in the middle, and beautiful at the end. sorry my comment was upsetting to you, I had no intentions to insult you family or Thai culture. I will not bother you on your website anymore (I promise), but before that I want to say one more thing. Yes, I’ve done my research on women’s issues in the world, on countries, cultures, etc, and I am familiar with Thai people, very polite people; I live in Toronto, it is a city like no other in the world because of multicultural society, so you get to know things. I think closing your eyes on certain issues does not make them disappear, it is something like in North Korea, or former Soviet Union, where only positive news, only good things are allowed to be talked about, giving an impression of woderful happy society. Nuns in Thai Buddhism are not really accepted officially, they are struggling with attitudes that attached to women by theravadan buddhism and culture in Thailand, women are considered inferior and not capable of enlightment, and closing your eyes on the issues of human trafficking in Thailand is just very indifferent to the lifes of those girls and women, who are ok to work the streets but not ok to be ordained. Of course you can say that there are millions of happy Thai women, and millions of happy Saudi Arabian women, practicing their woderful beautiful believes systems, hoping getting to heaven as a man. What a wonderful world we live in. And yes, I am very, very greatful that Kun Sunim is in female form, I am greatful for this every day, it gives me strength and if I like her teachings above all others it is not a bad thing, because I think her teachings encompasses all teachings, buddhists and non-buddhist. I have respect to other teachings, like Theravada, great respect, but that’s about it, nothing more than respect, it’s been along time since Buddha spoke and things could’ve bent a little and influenced by cultures, so why follow the herd. And as of other religions, I respect them very much too and I studied them, so I could know about it, and maybe compare, and for me it all comes from the same source, however by the time it gets here, some things get distorted. If I’m not mistaken, similar misunderstanding’s of a woman’s ability to attain enlightenment exist in Korean Buddhism, and in Tibetan Buddhism, there is also the belief that if you are gay or mentally challenged, you also can’t attain enlightenment. I always try to keep a “don’t know” mind, otherwise we get so caught up in what we think we know that we don’t realize the things we need to learn. That said, anyone who knows Marcus also knows that he does not close his eyes to anything! First of all – please don’t say that you won’t comment here any more! It is totally wonderful that you are here and I for one value your comments and input very much indeed. Not only am I delighted to see you here, I also want to repeat my invitation to you to write a post for us here some time. You have wonderful things to say and I believe that your presence here enriches this blog no end. As for your comments, they were not at all upsetting to me – I just found aspects of them that were inaccurate and, in their generalisations, potentially insulting to all those Theravadan practitioners who are not, believe me, still in “first grade”. You are right that there are issues around the role of women in Thai Buddhism that need to be addressed. I certainly don’t disagree with you. Where I do differ is on how they can be addressed. Simply put, I think women and their allies in the Thai Sangha can resolve these issues themselves and do not need the intervention of teachers or teachings from outside. Of course, having those teachigs available is wonderful and if Thai women wished to look for support or role models (KunSunim springs to mind!) from outside, that’s great. But I believe in the strength, determination and resilience of Thai women and believe that they can resolve their issues in their Sangha on their own terms. Tanya, like you, I am grateful to KunSunim and the teachings of Hanmaum and, like you, it feels like the right path to follow and I rejoice in having found a spiritual home. You are right to feel that your path is the best! But having found the path that is the best for you does not mean that others on other paths are in “grade school” or are just “following the herd”! The Dharma talk that this post describes was a beautiful event of friendship between traditions looking for the things that pull us together as Buddhists (whilst maintaining our own traditions) rather than those things that divide us. Both of these fine monks respected and developed the teachings each offered, whilst remaining true to their own traditions, to shed light on all of our paths and to lead us deeper and more fruitfully into our practice. And I believe that’s what this blog is aspiring to do. To inform people about the Dharma path beaten out by KunSunim and encourage and support those who feel drawn to follow it. And in that you have a very important role to play, so please stick with us. I offer my deepest apologies if what I’ve said here prompts you to want to stay away. Thank you for posting this:). I like to hear what was said and it makes me reflect on my own practice and what I have found so far through my journey. It gave me better clarity on something that has so far eluded me. I see someone else’s way as they have a certain calm that I seek, I try theirs out, and fall further from my truth, as I am identifying with their way, mine can only come from my own teacher, buddha-nature/Juingong, or whatever one wants to call it, and although inherently not separate from any other beings, still leads me differently than another. When I turn inward and ask about something, then I am led to another’s words or teachings that answer the questions, or it comes to me, or sometimes not…:) But the words that have lead another, help to, as Eckhart Tolle points out, “give pointers” and through different teaching and words and actions lead me on my own journey. So I am grateful to all whether practitioners or not, as Kun Sunim says that everything is a teacher, and all have truth, but it is for me to listen to my Juingong that is where I will find and know my truth. Such a lovely comment, so well put, thank you so much.